According to Wikipedia, “A marketing plan is a comprehensive document or blueprint that outlines the advertising and marketing efforts for the coming year. “ And for small business owners, it’s one of the most important things you can do to make sure you achieve your business goals. Have you created your 2019 marketing plan yet? If not, then this workshop is just for you! 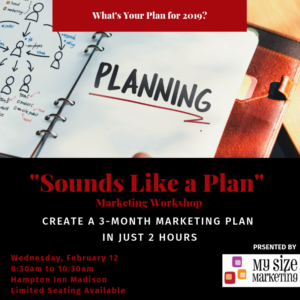 In just 2 hours, marketing expert Melody Tholstrup of My Size Marketing, will guide you in creating your own 3 month marketing plan to help you kick off 2019 the right way. Limited Seating Available, so save your spot today!